There is so much more to a petticoat than meets the eye. A well-designed one allows full freedom of movement, be it while sitting or climbing stairs. What’s in a name? Did you know that Kanchi cotton sarees are actually from Tiruvanna­malai? Or that only one solitary weaver family produces the genuine handloom ones? An informative primer to ethnic textiles and these pieces of trivia were in store for the participants of the Textile Walk in T’Nagar, led by Sreemathy Mohan (with inputs from Sriram V.), as part of the ­Madras Week celebrations. 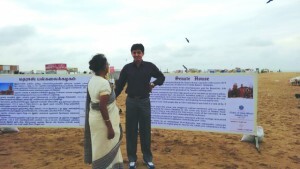 The starting point was Co‑optex, Pondy Bazaar. Established in 1935, Co-optex has over 100,000 weavers under its wing and is one of the oldest (and largest) handloom cooperatives in the country. Displays of the myriad weaves of Tamil Nadu, including little known Negamam, Aruppukkottai, Kodaa­likaruppur, Woraiyur, Jayankondam, and the recently rejuvenated silk and cotton blended Koorainaadu (from which the term koorai pudavai comes) gave us an instant understanding of the available variety. We learned that tell-tale pin-holes at the edges distinguish a handloom saree from its machine-made clones. Further, power loom fabric looks perfectly uniform viewed in a single layer against light, whereas handloom cloth has visible texture differences. Venkatesh Narasimhan, ias, Managing Director, Co-optex, was on hand throughout and informed us that a handloom saree takes 24 times longer to weave – hence the higher price tag. Very labour intensive, the weaver moves his hands and legs over 16,000 times for one saree. Keeping up with the trends, Co-optex has brought out a ­series of Organic Cotton sarees using carefully sourced cotton grown without the use of any chemical pesticides or fertilisers and dyed only with plant-based products such as an eye-catching pink using banana flowers. We could also see and feel a very special memo book prepared by Co-optex for Jawahar­lal Nehru, who was most ­impressed with each leaf made of a characteristic Tamil Nadu fabric. Next, we headed for APCO whose staff showed us lovely Pochampally Ikat (single and double), Gadwal, Bandar, Ven­ka­tagiri, Mangalagiri, Narayan­pet and many other weaves from Andhra Pradesh in silk and cotton. Cotton ikat sarees are available at inexpensive rates as are beautiful sheet sets. After a brief stop at the Corporation hawkers’ complex, it was on to Naidu Hall. Founded in 1939, the founder, M.G. Naidu, was a trailblazer. When neither readymade blouses nor brassieres were heard of, he created the market and spearheaded the employment of female sales assistants. A quick halt at Ramraj – purveyors of dhotis ­including innovative ones with Velcro – was followed by a peek-in at Kerala Saloon – an old fashioned barber shop where hair is cut to the accompaniment of recorded prayer songs. Next on the tour was Palam Silks where Proprietor Jeyashree Ravi expressed her desire to spread a passion for sarees amongst college girls, even as she showed us her innovative designs and colours. Following a curbside tiffin of sweet and savoury kozhakkattais and coffee at Adyar Ananda Bhavan, the last stop was at iconic Nalli’s. 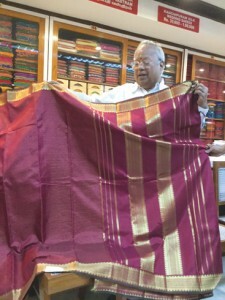 Sharing his experiences enthusiastically, Nalli Kuppu­swami Chetty personally showed us some of the establish­ment’s pioneering sarees, including the Darbarpet, uniquely designed and woven by his grandfather, Nalli Chinnasami Chetty, to present to King George V at the 1911 Darbar in Delhi. The distinct zari design of this saree appears to mimic the pillars of the Colosseum. He also explained how M.S. Subbulakshmi had provided a sample of thread requesting a saree to be woven in that colour, leading to the eponymous MS Blue. Another recollection was Padma Srini­vasan of the TVS family, stopping by with a visitor from abroad – who turned out to be none other than Jacqueline Kennedy! Many handloom weavers are discouraging the next generation from continuing in the business due to an uncertain ­future. By purchasing and flaunting handlooms, every individual has an opportunity to make a difference and keep India’s rich textile heritage alive. More and more patronage translates directly to higher income for the weavers. 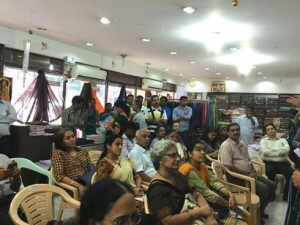 If the after-walk conclave at Co-optex was any indication, such events will go a long way to increase sales, raise awareness and further the cause – educating consumers on the hard work, intricacies and detail involved in every hand-made creation. By the way, that petticoat? M.G. Naidu of Naidu Hall designed an 8 piece pattern, 75 years ago, which continues to be a best-seller! 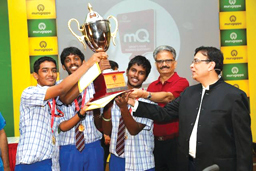 The 5th edition of the Madras Week Murugappa Madras Quotient Quiz had 320 selected teams, with three students each, participating. At the end of the one-and-a-half-hour, six-team grand finale, the team from Chettinad Vidyashram (Ashwin Senthil Kumar, Siddharth Pillai and Sethu Aswin) emerged champions. The team from AMM Matriculation HSS (Shubhankar Agrawal, Sarvesh and Saikrishna) was runners up. The quizmaster was once again Dr. Navin Jayakumar. The prizes were distributed by L. Ramkumar, Managing Director Tube Investments of India, a unit of Murugappa Group. 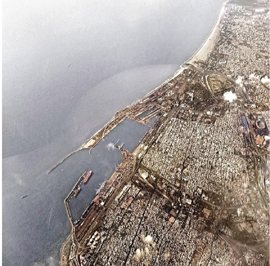 An exhibition titled Madras Transit: Contemporary Aerial Photographs of Chennai by Robert D. Stephens, featuring 25 colour photographs of Chennai taken from 10,000 ft. above sea level, was held at The Folly, Amethyst, as part of Madras Week. 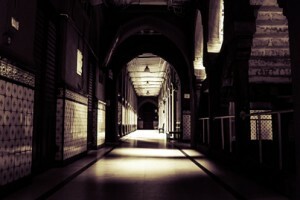 One of the exhibits was this picture titled ‘George Town Grid’ which is featured alongside. 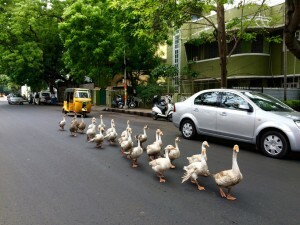 Stephens is a Bombay-based architect, who regularly visits Chennai. He had long wanted to present a rather different view of the various parts of the City. And the results drew a great deal of attention at this week-long exhibition. 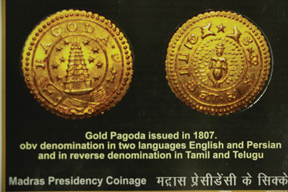 A Special Postal Cover for Madras Day 2015, with the theme ‘Coins of the Madras Presidency’ was released on August 22nd at the Fort Museum by PMG Mervin Alexander and at centre by Nalli Kuppuswamy Chetti and Moortheeswari, of the ASI, who heads the Museum. 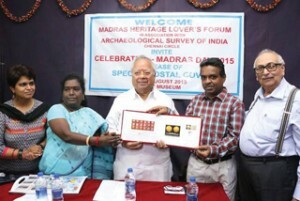 The cover was designed and produced by D.H. Rao (extreme right) for the Madras Heritage Lovers’ Forum. The Special Postal Cover is on sale at Amethyst, where Rao, a collector of stamps, postal stationery, currency and pictures of old Madras, spoke on Re-discovering Buckingham Canal having explored every metre of this canal that runs from Pedaganjam (A.P) to Marakkanam (T.N.). 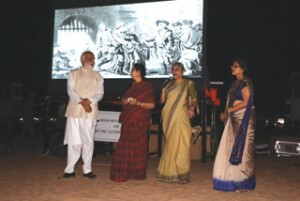 INTACH-Chennai, conducted a unique event on Madras Day, August 22nd, by screening on the Marina its film The Story of Madras – The First City of Modern India in association with the Corporation of Chennai. The narration for the film was by S. Muthiah, the chronicler of the City. The film aims at increasing the awareness and appreciation of local history and heritage among citizens, starting with children, so that they will be inspired to preserve and protect it for generations to come. Copies of the film were distributed free during Madras Week to schools that wanted them. They can now be got by schools for Rs. 150 each from intachchennai@gmail.com. 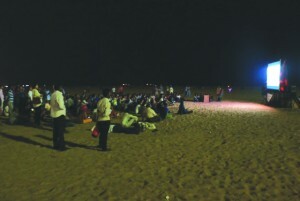 The public screening of the film was viewed by hundreds on a large outdoor screen on the sands, recalling the times of yore when public gatherings on the beach, to listen to speeches, patriotic songs or radio programmes were ­common. 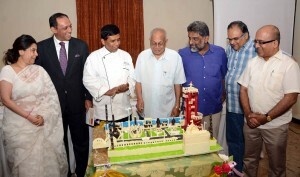 The Prince of Arcot, Mohammed Abdul Ali (top left) who was present on the occasion, released a Heritage Map of Chennai, a guide to the landmarks of the city, compact and easy to carry in one’s wallet. The map, courtesy the TTK Group, was received by Ranee Vedamuthu of Anna University’s School of Architecture. 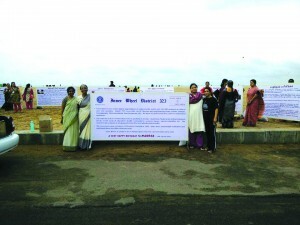 Inner Wheel Clubs of District 323 put up banners on the Marina Beach in Tamil and English to highlight the history and heritage value of buildings in the vicinity of the Marina. Members were on the sands behind the Gandhi statue from 5.30 am. The response was excellent – they distributed 500 laddus to visitors! The State Health Secretary, Dr. Radhakrishnan (extreme right), who was the Chief Guest for another function nearby, dropped by even before going there and displayed considerable interest in the display. Madras Week 2015 saw a very interesting variety of events, but while the majority of them targeted adult audiences there were a few that had children in mind. One was a storytelling session, The story of Madras, organised by Storycorner at Bookmine for children between the ages of 4 and 10 years. “Children are key stakeholders in preserving history and heritage, which is why I thought that it was important to do a programme that brought alive these slices of history that tell us how Madras was born and how it grew. Otherwise all of this could easily be lost in the mists of time,” says Sudha Umashanker, journalist, storyteller and founder of Storycorner at Bookmine. Turning back the pages of history, she pieced together the story of Madras in a way that would appeal to children. Tracing the journey of the East India Company’s Francis Day from Masulipatnam and Armagaon to Madraspatam by ship (not to forget the masula boat ride), the grant of the land, and the building of the factory etc. at Fort St George, with men carrying loads of sand from the Cooum on their heads, to a display of the cotton, silk, brocade and spices that earned the Company its wealth, the numerous attacks, a look back at the spectacular growth of the city, and finally all the children singing Happy Birthday and signing a birthday card for Madras were what the session at Storycorner at Book­mine was all about. The use of props, songs, a map (how important it is to encourage children to use a map and find places on it!) and getting them to visualise what life must have been like then made it a riveting experience. Viji Varadarajan, well-known cookbook author who attended the event, posted on social media. “Sudha Uma­shan­ker’s storytelling was inimitable. The excitement of the children was palpable. It was a great show and I was as delighted as the kids themselves”. Unusual Madras – The unexpected that breaks tradition and contradicts stereotypes. There were two sections: open or student. The best exhibits were displayed at City Centre. Your Editor’s choice of the most striking pictures was these five, above and on right. 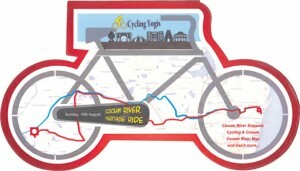 The Cooum River Heritage Ride was organised by the Cycling Yogis as a part of Madras Week 2015 on Sunday, August 16th. 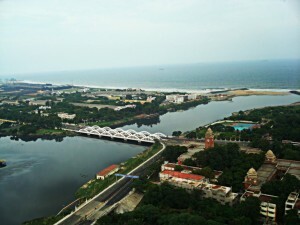 The ride started from CISF Guest House, Port of Chennai (where the Cooum river merges with the sea) with 79 cyclists pedalling their way in the wee hours of the morning (5.15 am) to reach the river’s, origin spot near Kesava­ram via Poonamalle High Road, Tiru­ma­zhisai, Tiruvallur, and Map­pedu. The Yogis reached the final ­destination, Koovam village (distance: 72 km), by 11.00 am. After a brief interactive session, the group visited important places, notable among them being Sivapuram Sivan Temple and Kesavaram. To return, a shuttle service was arranged (transport of the riders and cycles by vehicles). Buffet Lunch was organised for all the participants at Sathyam Grand Resorts, Sriperumbudur. Earlier, a special 25-page booklet on Cooum history was released by S. Muthiah on August 14th at KRM Public School, Perambur. The ride generated much camaraderie army participants and spirit of Madras Week. As a culmination of a year-long search and tabulation by several cultural cartographers of historical events along the 70 km stretch of the terribly abused Cooum river, a presentation was made to a gathering in a heritage building along the Cooum – the Madras Literary Society. Novelist R. Venketesh explained the various historical happenings on the Cooum banks over several centuries, ranging from a Rastrakuta-Chola war, the first plane in Asia, and Burmese and a Gaekwad exiled on College Road to Shakesperean plays in Tamil staged on its banks. As part of its Madras Week celebrations, the Roja Muthiah Research Library, Taramani, organised ‘History through invitations’, an exhibition of invitations received over the years by the late M.H. Cassim Sait. 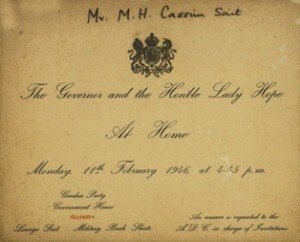 Cassim Sait was a businessman and a landlord. He and his maternal uncle Zackria Ismail Sait were involved in the surveying and sale of large plots of land in and around Madras. Some of the areas where they had development plots were Haddow’s Road, Rutland Gate, Mount Road, Perambur, etc. A layout in Kodambakkam is called Zackaria Colony. Cassim Sait was a Member, Board of Industries, Madras; Member of the Senate, University of Madras; Councillor, Corporation of Madras; Chairman of the Town Planning Committee, Corporation of Madras; Honorary Presidency Magistrate; and District Governor, Lions International. He was also involved with New College, SIET College, the Anjuman, the Muslim Chamber of Commerce and serving other institutions. His wife, Sarah Cassim Sait, was also involved with various educational and charitable institutions. She was Vice-President of the M.W.A. Matriculation School, Gopala­puram, and Vice-Chairman of the Board of SIET College (now Justice Basheer Ahmed Sayeed College). The invitations received by Cassim Sait offer an insight into the Muslim leadership in Madras Presidency. One of the invitations indicates that Lions International established its first club in South India in 1959 with The Lions Club of Madras. The complete organisation work was done at Cassim Sait’s residence in Haddow’s Road. Cassim Sait and his son Mahmood Cassim were among the founder members of the Club. Cassim Sait was elected the District Governor of Lions District 304S in 1965. This District covered the southern States of Madras, Karnataka, Andhra Pradesh and Kerala and also Sri Lanka. 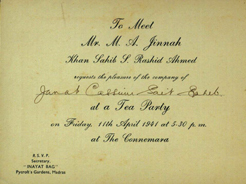 Many of the invitations are to celebrations held each year during Meelad Un Nabi. This function was hosted by a committee of hosts comprising some of the leading Muslim luminaries and businessmen of the day. The Governor of Madras was often the chief guest at this function, which was often held at the Connemara Hotel. Dr. S.K. Khadri is probably the only person to have been a host of the earlier version as well as of the current Eid Milan that is hosted by the committee of hosts. He continues to be a convener of this initiative communal command harmony. Janab K.T. Sheriff Sahib: He was the Honorary Secretary of Anju­man-E-Himayath-E-­Islam and the Anjuman-E-Mufid-E-Ahle-Islam. His son, Dr. Kamal Sheriff, was the first Vice-Chancellor of the Dr. M.G.R. Medical University. He also served as the Chairman of the Tamil Nadu State Minorities Commission. Janab M .S. Abdul Majeed Sahib: A member of the Muslim Educational Association of Southern India (MEASI), he was a major figure in the founding of New College. He was the secretary of MEASI in 1949 and President in 1963. He was a member of the Madras Legislature. He was connected with the handloom trade and industry. Janab M.J. Jamal Mohi­deen, m.p. : He was a President of MEASI and the founder secretary of Jamal Mohamed College, Trichino­poly. He was an MLA and also served as a Rajya Sabha M.P. 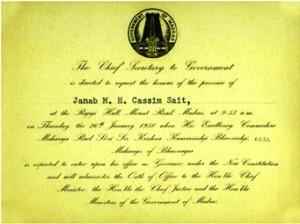 Janab C. A. Mohamed Ibrahim: He served MEASI in several capacities. He was the Honorary Warden of Boddam Hostel run by the Association. He was also connected with the founding of SIET College, teaming with its founder, Justice Basheer Ahmed Sayeed Sahib. Janab T. Abdul Wahid Sahib: A member of MEASI, he was one of the members of the Managing Committee of New College for several years. He ­be­came the President of MEASI. He was also the President of Anjuman-E-Himayath-E-­Islam and also the Anjuman-E-Mufidul-E-Ahle-Islam. A leading member of the leather industry, he was the Secretary of the association of hides and skins merchants – AISHTMA. He was a Lok Sabha member from Vellore. Janab Abdul Hameed Khan Sahib, m.l.c. : He was a member of the Legislative Council and the Corporation of Madras. He was also the Dewan of the Prince of Arcot. A Vice President of MEASI, he was also connected with the University of Madras and Annamalai University. Janab Moulvi M. Nazir Hussain Sahib: A President of MEASI, it was during his Presidentship (1947) that New College was started. He served as the Sheriff of Madras. He was a major dealer in hides and skins. Khan Bahadur Khader Nawaz Khan: A leading businessman, educationist and philanthropist, he was conferred the title of Khan Bahadur by the Government. Khader Nawaz Khan Road in Nungambakkam is named after him. Janab Khan Bhadur A. Abdul Kareem Sahib: A pioneer of the beedi industry in Madras. A great donor for MEASI projects. He was one of the Vice-Presidents of MEASI and later its Treasurer. Janab Malang Ahmed Batcha Sahib: An important member of the leather trade, he was the first graduate from Vaniyambadi. He was a Secretary of MEASI and later its President. Janab Jamal Mohamed Sahib: A leader of the leather industry, he was a President of MEASI. The Jamal Mohamed College at Trichinopoly is named after him and his family is involved in its running. Moulvi Syed Abdul Wahab Bukhari Sahib: A person of the highest Islamic scholarship, he was a great teacher, who served as the Professor of Islamic Studies at Presidency College, Madras. He was later the Principal of New College and still later the Rector of the Jamalia Arabic College, Perambur. Khan Bahadur Mohammed Musa Sait: A leading businessman, he was a Sheriff of Madras and received the title Khan Baha­dur. Khan Bahadur Adam Hajee Mohomed Sait: He came to Madras to get his mother’s eyes treated around 1908. He started as a hawker in George Town, but proved so successful he purchased a building in Bunder Street that became his residence as well as his business place, where he developed an import-export business. He was a Director of the Imperial Bank for 14 years, became Sheriff of Madras in 1933 and was awarded the title Khan Bahadur. He was also the President of the Southern India Chamber of Commerce and Industry. Janab Justice Basheer Ahmed Sayeed Sahib: He played a significant role in promoting education in the community, both as secretary of MEASI and, later, as founder of SIET Women’s College, now renamed Justice Basheer Ahmed Sayeed Women’s College. 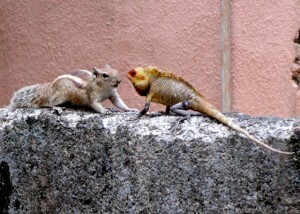 He was a Judge of the High Court of Madras. Khan Bahadur Yusuf Sait: A Sheriff of Madras, he also served as President of the Madras Chamber of Commerce, President of the Cutchi Memon Union, and President of Hajee Essa Abba Sait Endowments. He was one of the partners in Joonus Sait & Sons. After his retirement from this firm he started Yusuf Sait & Sons. He was conferred the title Khan Bahadur. Janab Hakim Syed Niama­thullah Sahib: A Corporation Councillor for many years, he became Mayor of Madras. He served as Treasurer and Acting Secretary of MEASI. Khan Bahadur Sir Moham­mad Usman, kcsi, kcie: He served as Minister of Home of Madras Province and as acting Governor of Madras, the first Indian to act as Governor (1934). He was the first Indian President of the Rotary Club of Madras. Usman Road in T’Nagar is named after him. Janab Ameen Khaleeli Sahib: Scion of a Persian family settled in Madras, he was a leading businessman. He was a Vice President of MEASI. His son, Akbar Khaleeli, a member of the Indian Foreign Service, served as Ambassador to Italy and High Commissioner to Australia. Janab A. M. Ubaidullah Sahib: He was the first Muslim chartered accountant. He played a significant role in not only MEASI, but also in founding the Southern India Education Trust and SIET Women’s College, ultimately becoming its Chairman. Janab C.H. Sibghatullah Sahib: Long a member of the Madras Corporation, he later became the Mayor. He was a businessman.